Dirk Kuyt believes that Liverpool can still qualify for the Europa League final despite being beaten 1-0 in Spain. Lopez scored a goal in the 92nd minute to help Villareal defeat Liverpool. He stated that this is only the first-half of the tie and that there is still 90 minutes to play for in the semi-final. He believes that the side will be able to overcome the deficit at Anfield and that they still have a chance to make it to the final. Kuyt was speaking to the Dutch press ahead of Feyenoord's final few fixtures in the Eredivisie - with tickets for the team's final game at home amongst the most searched for items on www.livefootballtickets.com because of the impact their result could have on where the league championship ends up. However, whilst he was in a confident mood, manager Jurgen Klopp confessed that he was not pleased with the way his side conceded a goal in injury time. He said that they lacked luck because there was no offside against Adam Lallana, and this would have given them time to regroup and reorganize their defence. He also had issues with Moreno, as the full-back was nowhere to be seen on the goal, but he admitted that errors do happen and that they have to accept it and moved on. The Liverpool manager thought that they would have encountered more problems in Spain, but he is satisfied the way the game went. He said that his team defended well and managed to create some chances in the game. Because of this performance, he still believes that they can overcome the deficit at Anfield and make it to the final. For him, the game at Anfield will be a different one and this time, they will be attacking Villarreal. Liverpool played a more defensive game in Spain without a striker in the team, supposedly because Klopp and Sturridge have fallen out. 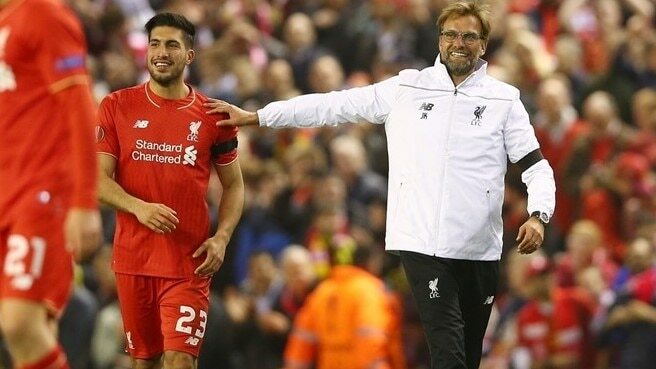 Indeed, Sturridge was left on the bench as Jurgen Klopp tried to stifle Villarreal attack. Liverpool did manage to create some chances, though. Allen fired directly at the keeper in the opening stage of the game while Firmino managed to hit the post midway through the second-half.